The Currant Beckwith Sport Coat is a red currant, lightweight sport coat with a heathered appearance and linen-like handfeel. Lightweight and perfect for summer layering, this sport coat is constructed from a very fine twill weave of 50% Wool, 30% Silk and 20% Linen. Available exclusively in our tailored fit. 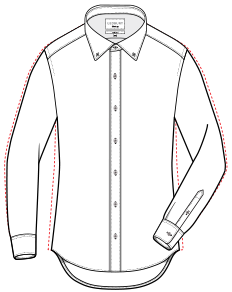 Unlined to offer perfect fit and finished with double vents, two patch pockets, and a welt pocket on the left chest. Fit: Our Tailored Fit features higher armholes and a more tailored waist, and runs trimmer than our old slim styles. Sport coat is unlined. If in between sizes, we recommend sizing up.